Once the Cobras fought the implacable alien invaders, the Trofts, to an uneasy stalemate. But in recent years they have faced an enemy more insidious, the oppressive regime known as the Dominion of Man. Now, the Cobra Worlds find themselves under the boot heels of the Dominion, forced into what amounts to slavery, living under martial law. But two clans of Cobras�the Moreaus and the Brooms�will not stand idly by and let the Dominion run roughshod over their home worlds. Now a threat from without looms. The alien Troft are again planning an attack. Before, they came to conquer. This time they�ve come to annihilate. 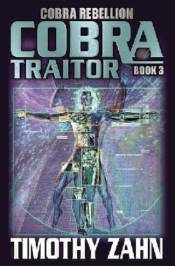 If the Cobras are to survive, they may have to do the unthinkable: align themselves with the hated Dominion. Cobras are not known for taking the easy path�and this may be the hardest path of all. But If the Cobras can manage to avoid complete destruction or abject slavery, a new day may finally dawn on the Cobra worlds. The day of Freedom.